I'm writing a series of small garden posts for those with a small garden and those like me who do have a bit of space but don't have the time to manage a full garden veg patch. In the dim and distant past I did grow potatoes on a veg patch and they were absolutely delicious but it was a great deal of effort keeping it all tidy and weeded. You needed to regularly bank it up whilst they were growing and we kept finding potatoes growing there months after as we hadn't dug up every single one. Reiterating the theme of this blog of money saving without too much effort and certainly without making life miserable I have embarked on a veg 'patch' suitable for the space or time restricted gardener. You should check out my first post featuring my (soon to be) tasty cherry tomatoes and then be equally in awe of my fantastic potatoes! So here's the deal, earlier in the year I popped to poundland and picked up a pack of seed potatoes and 3 bags (£4, I know, I know). I left them on the window sil for about a month or so to 'chit', this is basically just letting the potatoes sprout. 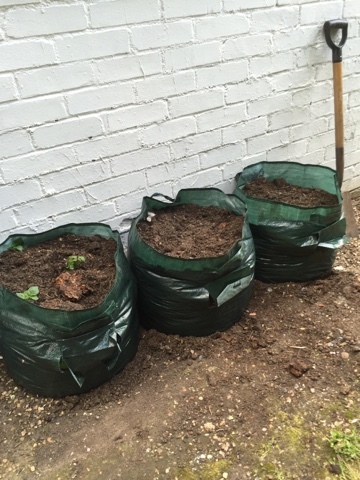 Once they had sprouted I planted out one bag with three of the seed potatoes in my compost filing the bags just over two thirds full. I left it a few weeks then planted out some more so that I would have the potatoes becoming ready at different times. I repeated this three times for the three bags. Ŷou can see the plants just poking through on the left. Once they have grown a little cover the greenery with soil, keep doing this until the bags are full then let the greenery grow free! In a few months these potato sacks should be full of lovely Maris Pipers, I've got to be patient and wait about 15-20 weeks from planting. Whilst you are too late for the standard main crop potatoes, It's not too late for this year with the autumn croppers still being available and will result in lovely tasty homegrown potatoes for Christmas. Click here to see a great AUTUMN CROPPING POTATOES pack of seeds plus bags. I think this is an ideal way to get started this year. These bags can be used again and again so you can have delicious potatoes throughout the year.